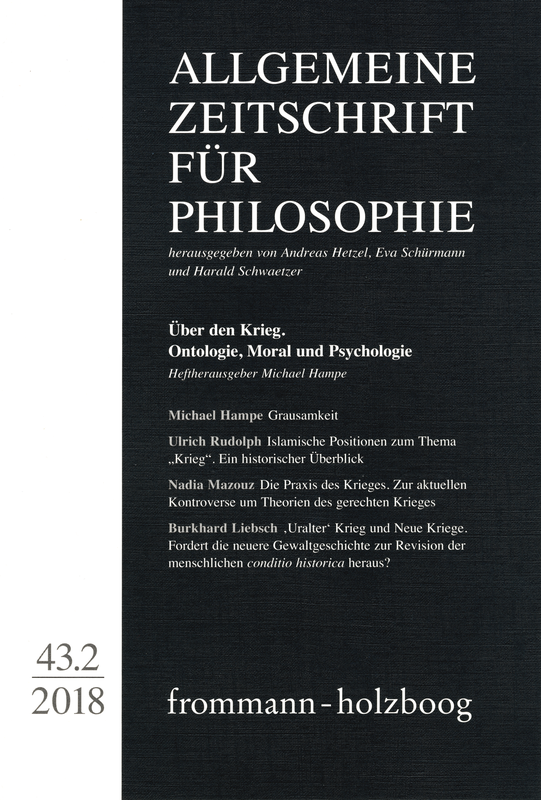 With contributions by Michael Hampe, Victor Kempf, Burkhard Liebsch, Nadia Mazouz, Ulrich Rudolph and Johann Szews. Lately, the word »war« in Europe has no longer been synonymous for a mere memory; it has become a real possibility again. Since Heraclitus, philosophy has been reflecting on war. However it does not see war only as principle of ontology and logic but also deals with its morality and the relationship between human beings and their »nature« and war. This issue considers all of these facets and addresses the question of a universal reality of war in the human world, reflecting on the relationship between morality and war, its cultural variability and its anthropological relevance. Its aim is to see to it that reflections on this subject, which unfortunately has become relevant once again in Europe, are carried out with the appropriate historical and intellectual depth. One of the most important contexts in which cruel actions appear is war. What is realised in this context is not some hidden cruel human nature. Rather, it is a form of experiencing reality by striving for intensity. In the Islamic tradition, the topic of war is addressed above all in reflections on Jihad (»exertion in God’s way«), beginning in the Quran and reaching on through the classical formulations of Islamic law to new interpretations in the present. Alongside these, a philosophical discourse on just and unjust war has developed that concerns itself with the possibility of thereby attaining a good (outcome), and in so doing draws on precedents from Antiquity. These days, there is a lively debate on Just War Theory. Prior to this, it seemed that with Michael Walzer’s contemporary classic Just and Unjust Wars the main theoretical work had been accomplished. However, since a decade or so an alternative theory has become popular in which the method as well as the moral content of Walzer’s theory are fundamentally criticized – the so-called revisionist theory of Jeff McMahan. In this article, this controversy is analyzed in the context of the historical development of Just War Theory. It is shown that some of the attributions can be traced back to misunderstandings, for instance the title »revisionism«. The alternative theories themselves are then presented and analyzed. They are shown to be implicitly based on a distinctive concept of the practice of war. Therefore, it is argued, it has been impossible to resolve this controversy yet. Burkhard Liebsch: ›Uralter‹ Krieg und Neue Kriege. Fordert die neuere Gewaltgeschichte zur Revision der menschlichen conditio historica heraus? This essay confronts an ontological notion of war (pólemos) that is often traced back to Heraclitus with the actual history of war – especially with the notion of so called ›new wars‹. Priority is given to the question whether this history affects the very essence of the human condition. This essay discusses how the relation between democracy and human rights is conceived of in contemporary ethics of migration. Communitarians consider cultural self-determination to be the normative core of democracy which in case of doubt always trumps the human rights of the »stranger«. In contrast, advocates of Political Liberalism take up the universalistic standpoint of impartiality upon which, they claim,»our« project of liberal democracy rests normatively. While morally convincing, it is doubtful whether this universalism really manifests an irremovable element of democratic common sense. The premise of social consensus central to Political Liberalism obscures the contentious realm of the political in which liberal and communitarian conceptions of democracy are in conflict with each other. The discourse of radical democracy can help to overcome this shortcoming by shedding light on how the political struggles of non-citizens bring about the liberal unity of democracy and human rights in the first place.